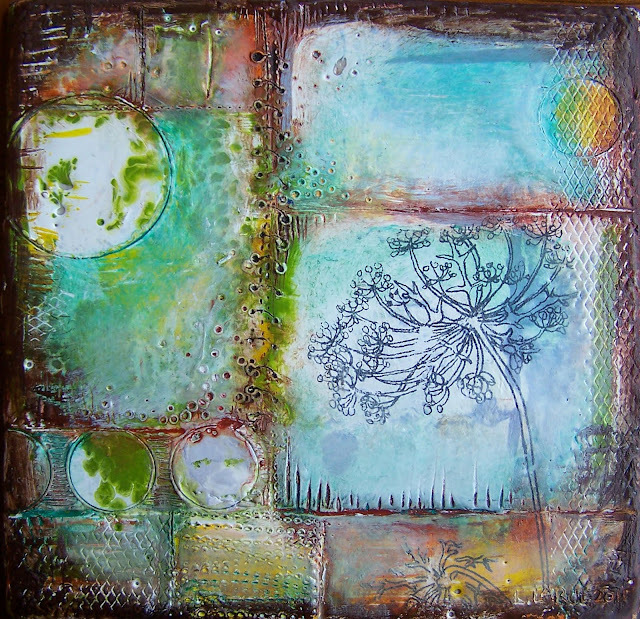 ﻿﻿﻿﻿﻿So here is the finished encaustic I gave my mom for mother's day. After doing the "kitchen test" I used my own tried and true method as well. I held it up to a mirror. I feel that just looking at it flipped helps me to see it as though it's the first time I'm looking at it. It really helps with composition and balance. Well it does for me anyways! So the only thing I added was the addition of some carved lacing over one of the vertical lines. One of the things I really liked about this one was the texture of the screen mesh I found. I adore the little diamond pattern so you might be seeing it often! I've got lots of new ideas and things I want to try out so I hope to have some more studio time really soon. And I also just wanted to show you the tulips that have finally opened! They are so pretty streaked with pink, multi stemmed, double tulips. Forget me nots, of course! Wow! I love it, Laura! VERY cool! Your flowers are incredible, too. Across the country, tulips keep appearing. I like that. They are so cheery! I really love your art that you gave your mum!AriadnefromGreece! Hi! This piece is AMAzing!!! I love all the colors and textures and well... everything about it! I'm so glad you stopped by and said "hi". You know what's weird... I found your blog within the last week somehow while hopping around but didn't get a chance to comment (I think.. or did I? lol) It would've been so hard to find you again because that day I was on a whirlwind mission to find something specific so I didn't make note of any of the blogs that I liked that day. So I was SO happy and surprised when I got a comment from you! Yay! So nice to meet you. Ha ha... word verification is "hunks"!! I have been away a while and you have been so busy, I love your encaustic piece, I bet your Mum loves it. I also have some tulips similar to yours they are truly beautiful. I must show mine soon. I love the birds you show and all the other bits. I hope I can maintain this blog hopping as it is always inspirational. the piece looks great, i especially like the "lacing"
mirrors work really well; sometimes if you don't have one handy, holding it up side down works too. beautiful gift for your Mom! My redbud tree's blooms are turning to leaves now. It's such an amazing site when encrusted in blooms. So happy to hear yours is in bloom. Look at all the lovely comments from all my blogger friends! I'd like to say HI to the new visitors too! Tracy, E, Liane and Marie- hi! And Barbara my mother got me the tulips last year from the Botanical Gardens so they are really unusual. The white and pink tulips are Candy Club and the double tulips are Mount Tacoma. the squirrels have eaten all my bulbs!